Well it was a mess last week and finally got finished up and then cleaned up yesterday! I’m glad to be settling back in this week and putting all my things back in the new cabinets. I have some additional space now as the main section was made about 12 inches higher and larger doors installed. 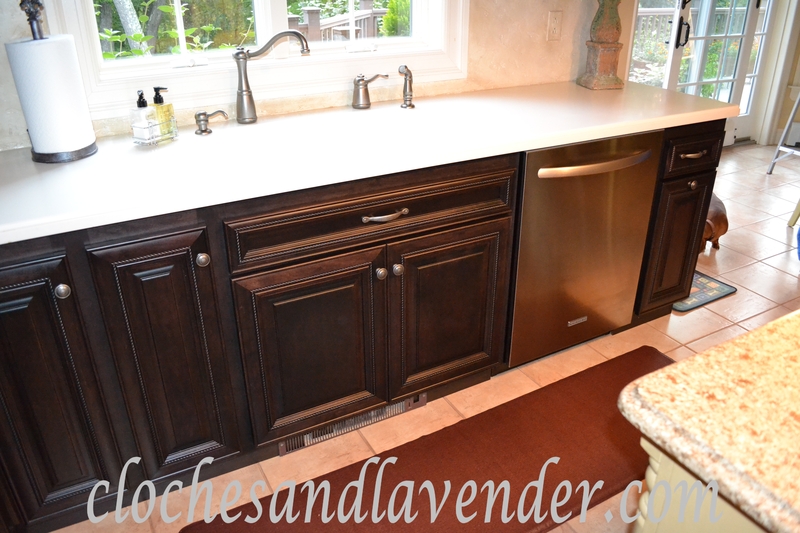 I also like that some small drawers were combined to make large drawers and the doors under the cooktop were changed to large pot drawers. I’m very happy with the espresso finish, it has just enough brown and black so it takes on different hues, depending on the light. 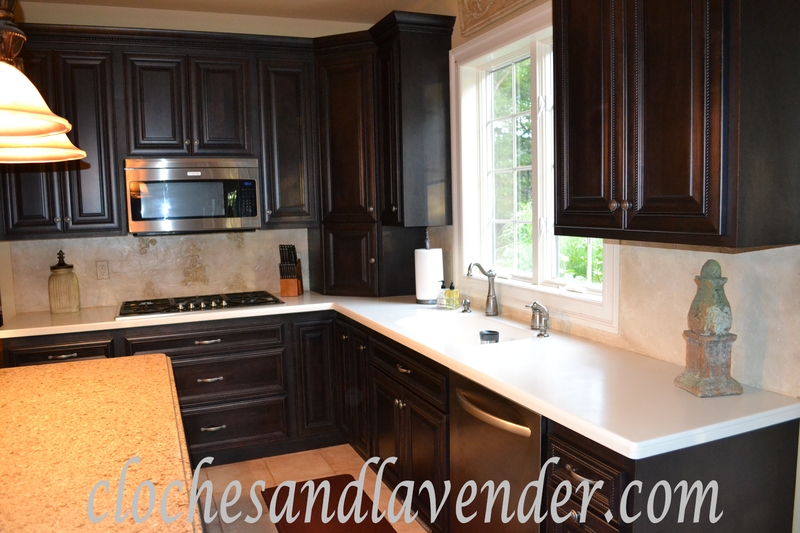 The new color works great with my island and counter tops. 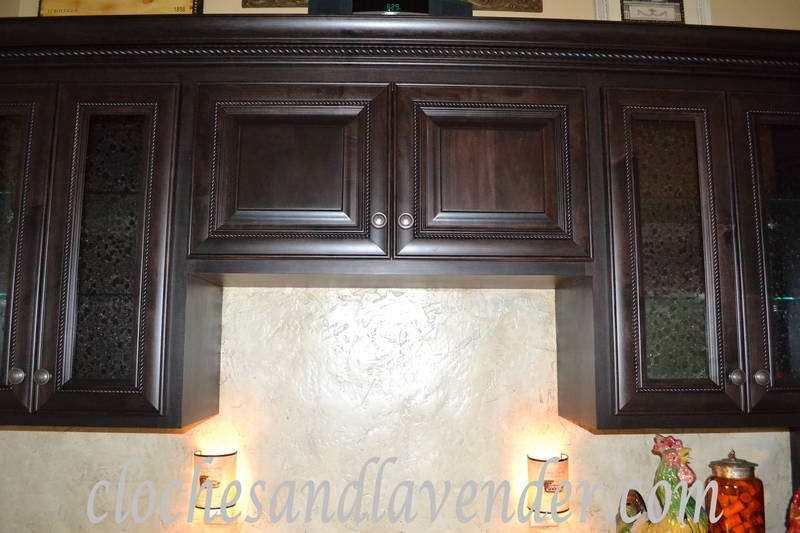 It really makes my backsplash pop and the project did not cause any damage to my plaster work! Here’s a few before and after shots so you can see the transformation along with a few random shots of the finished space. I am and when I come down everyday I forget that it is here. The color turned out wonderful! 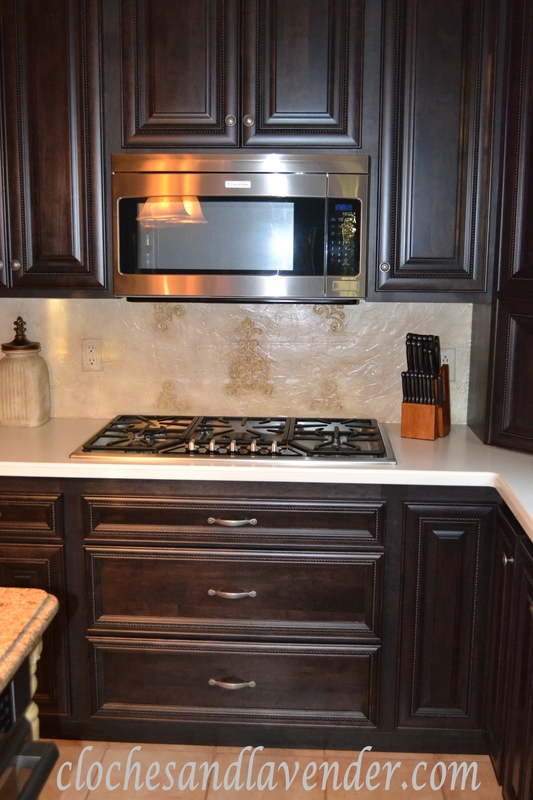 Really like it and it goes so well with the back splash! 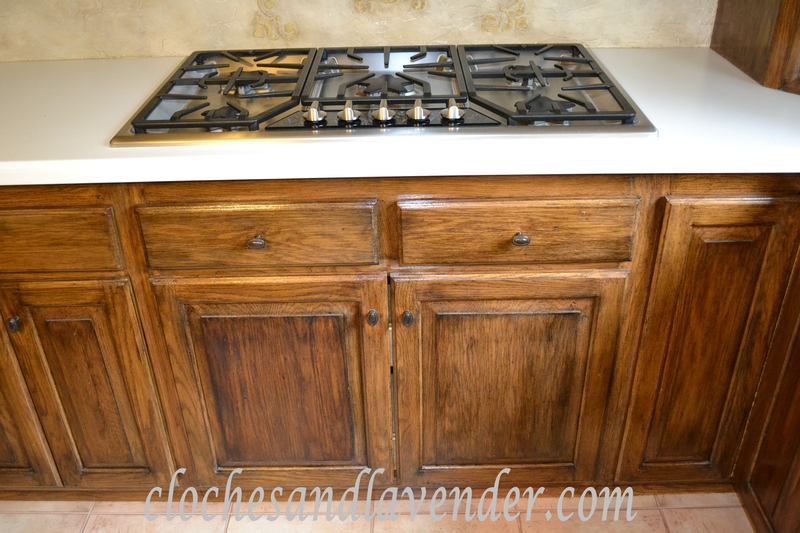 I am now jealous of your pot drawers under the range — those will be a definite must when we get around to replacing our kitchen cabinets! Thank you I love my new cabinets a lot!!! A beautiful transformation. 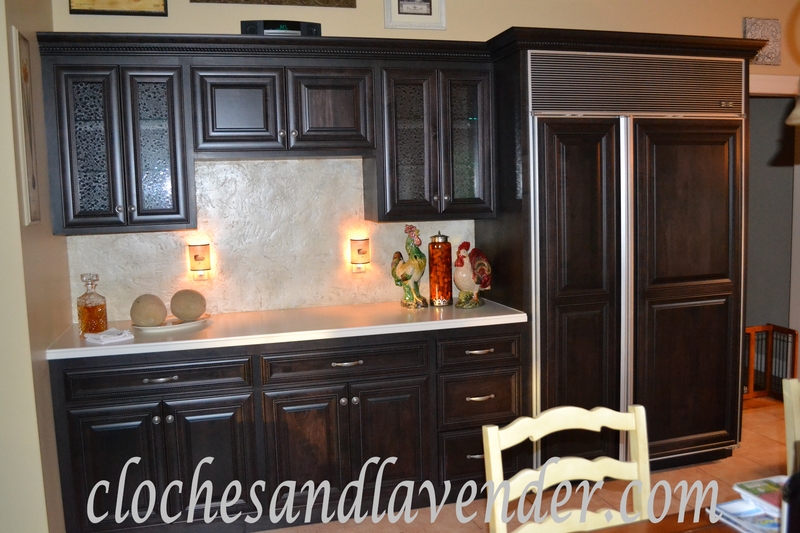 The cabinet color is great. 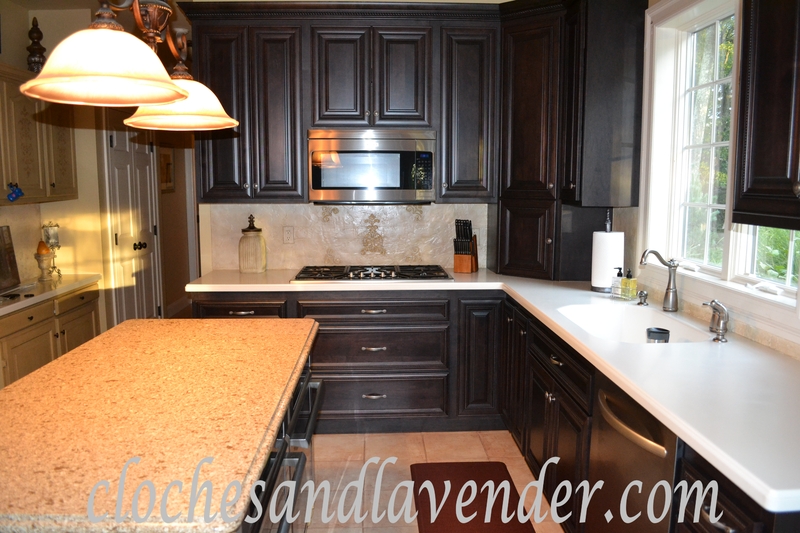 Your transformation is amazing, from simple kitchen to an elegant and fabulous kitchen!! Thanks for sharing, I love the color! Thank you so much it turned out better than I even imagined. Lori thank you so much. I absolutely love it and know how lucky I am. 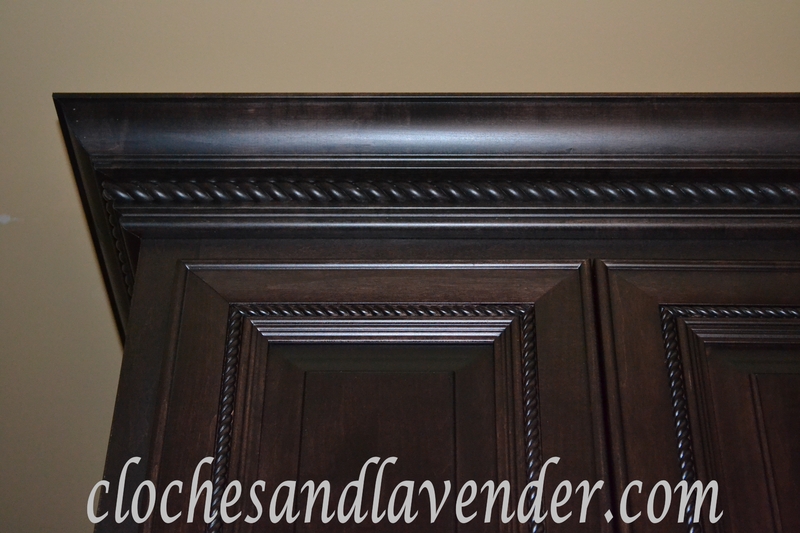 I hope you will follow Cloches and Lavender via Linky. I LOVE your makeover! 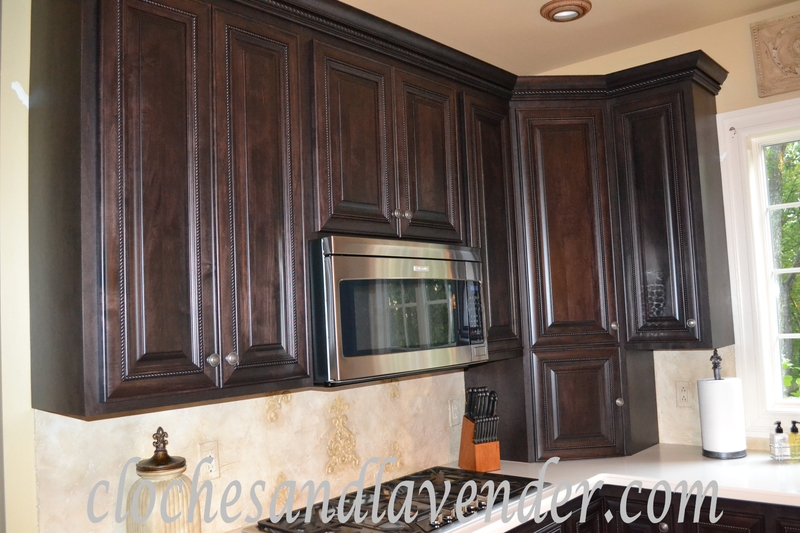 I would love to paint my cabinets black, but am such a chicken. It’s so nice to see something other than white! I also love the piece you have hanging over the window. Thank look I love it!! looks great! Feels like a whole new kitchen! It does feel that way. I love it! I love the new look. So modern compared to the before. You’ll love the drawers for the pots. We have those pull out drawers under the stovetop and don’t know what we did without them. So happy you are happy with your kitchen. Thanks for dropping by my blog this week! I love the new look of your page. It is great. Thank you so much for visiting. 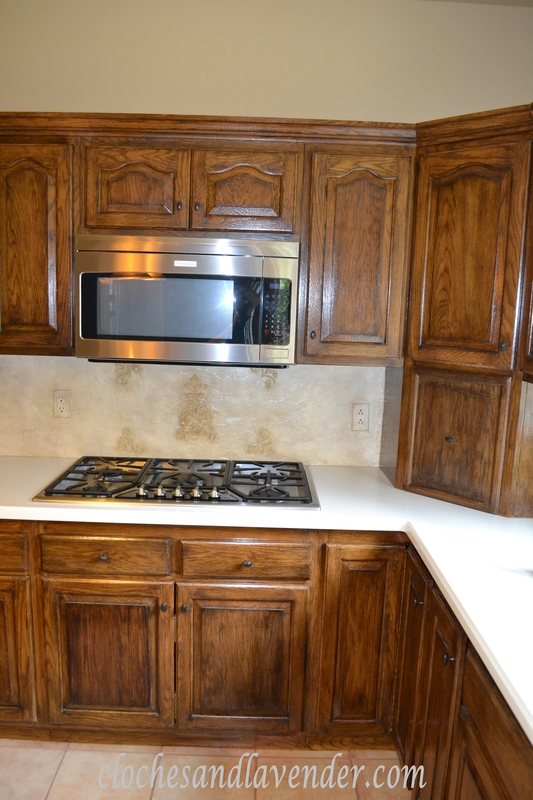 I love our new cabinets. I hope you follow me via Linky I follow you. What a beautiful transformation. I think it’s a lot easier to spend time in the kitchen when it looks so good. That is true. We are so haappy! Wow! What a job. 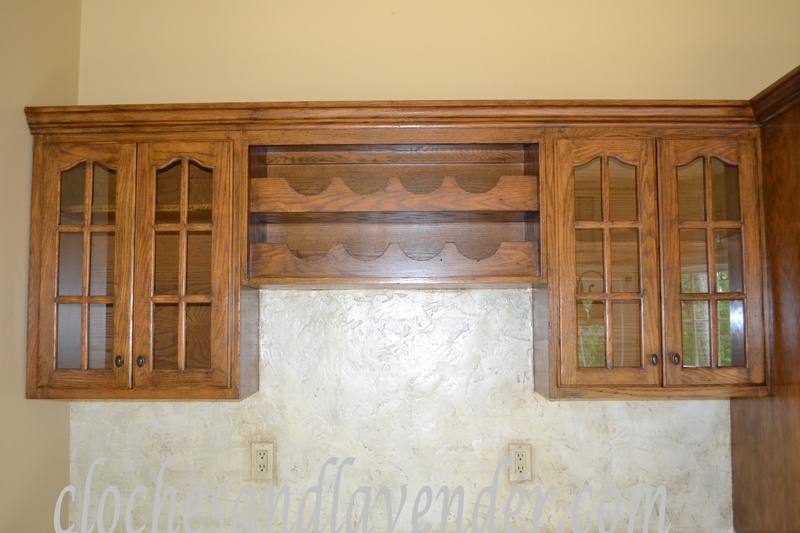 Your cabinets are gorgeous. They look so rich in their new color. You must feel like you have a brand new kitchen. 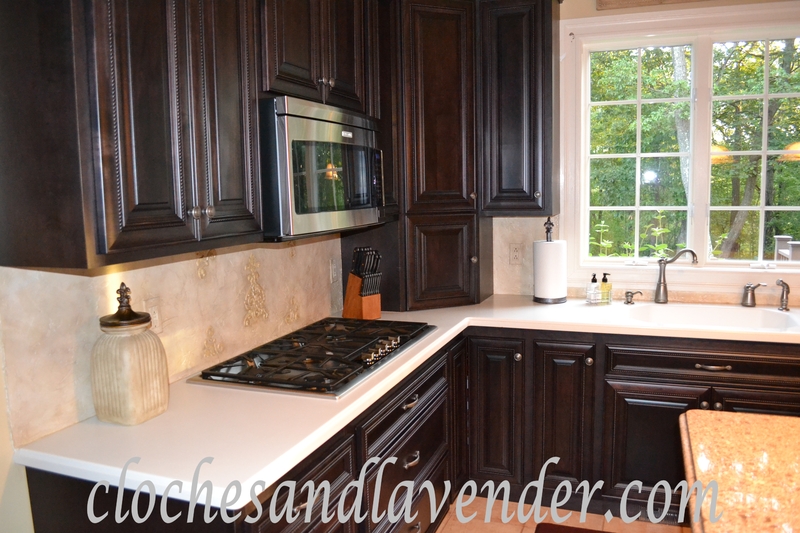 It is like having a brand new kitchen I would recomend refacing to anyone. I am so happy with the results. Beautiful, love the darker finish. Looks beautiful! 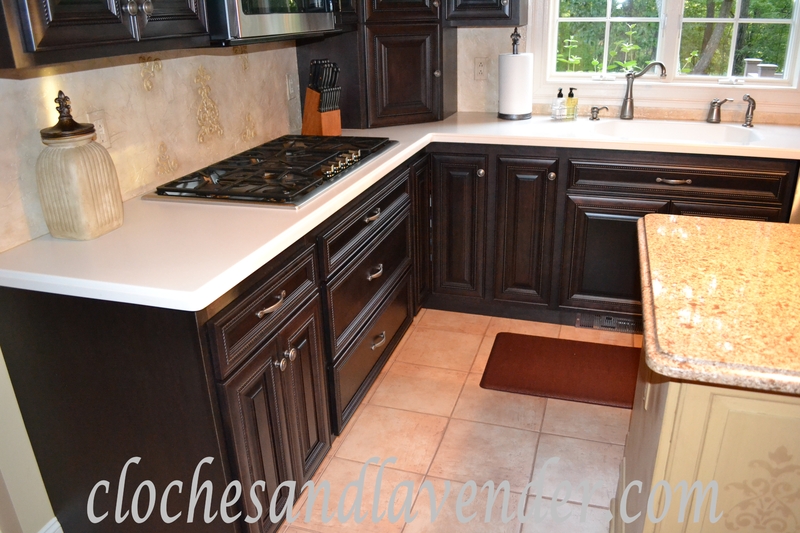 I, too, went darker versus white in my kitchen and just love the results! I am so very happy with our results too! Have no regrets going with espresso. Oh my gosh! That turned out gorgeous! 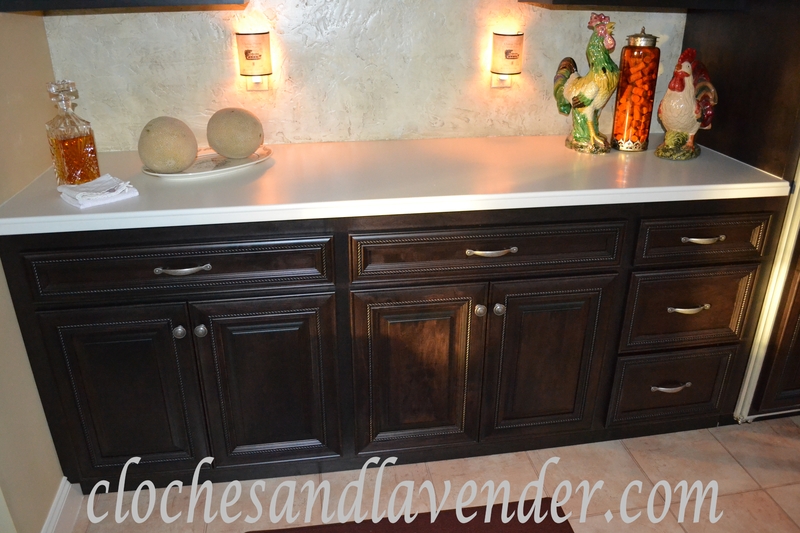 You totally transformed the look and feel of your entire kitchen. It turned out wonderful! Thank you for sharing at TTF and have a terrific day! Oh, I love everything about your new kitchen Cynthia! What a fabulous transformation. 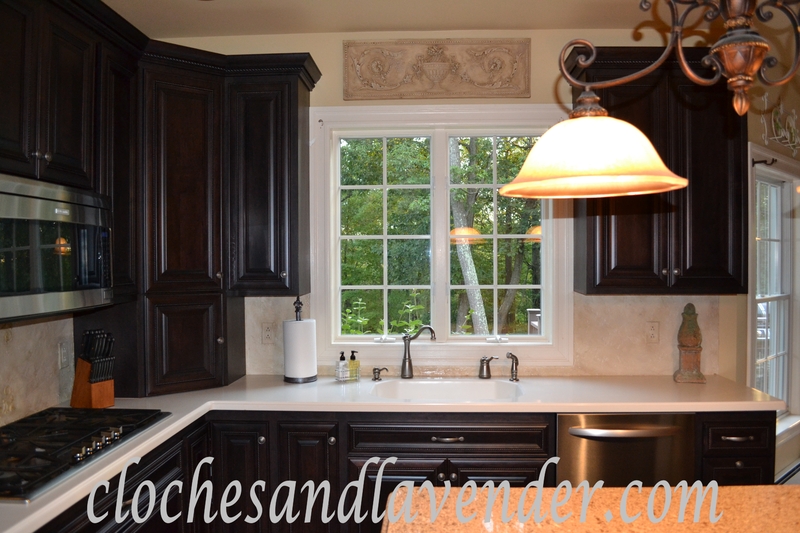 Love the glass inserts and the stenciling on your backsplash. You will enjoy this for a long time to come. I love our kitchen it is fabulous. 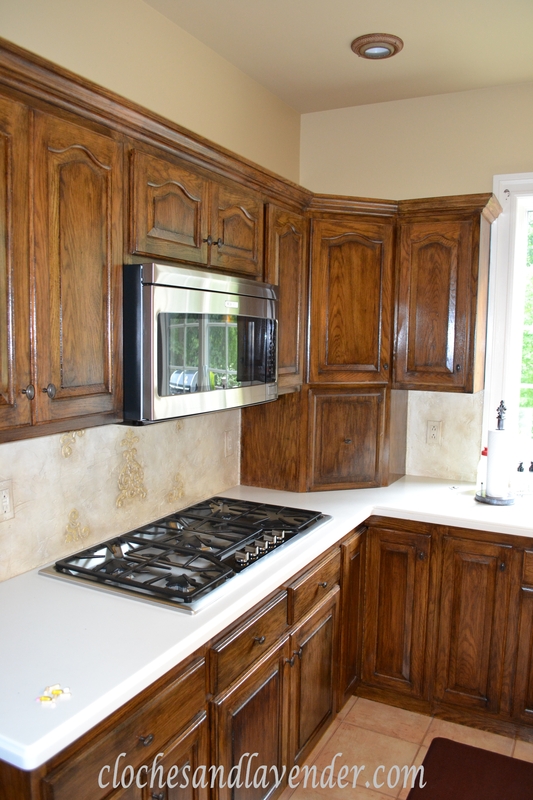 It shows off all the hardwork I put into doing that backsplash. Wow! Very pretty! Mine needs a major overhaul. Thanks for stopping by and nice comment on the necklace. It is ridiculous how gorgeous they turned out! 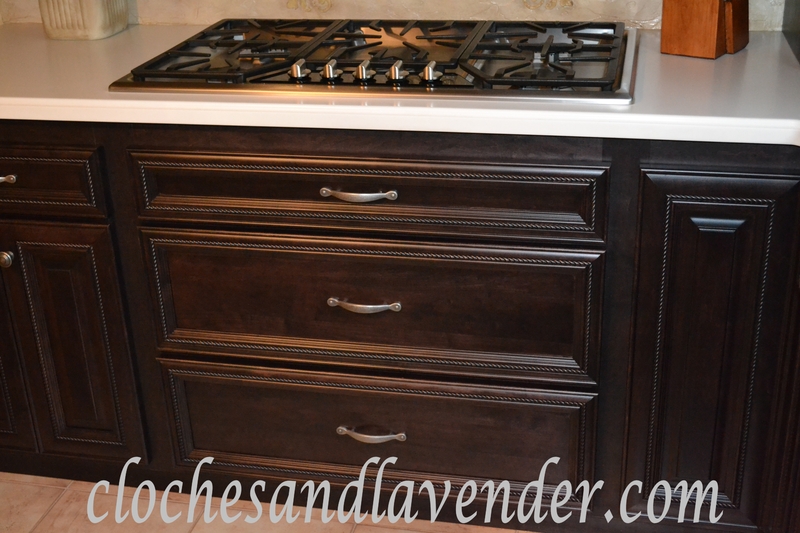 I noticed you opted for drawers under the stovetop instead of a cabinet.. how did you do that? Wasn’t there mechanical “stuff” under the stove top to work around?? Just curious as I have the same issue and would LOVE drawers!! No we had no issues. You should check it out because they are so great to have. Thank you so much you are so kind..
Cynthia, the kitchen is gorgeous. 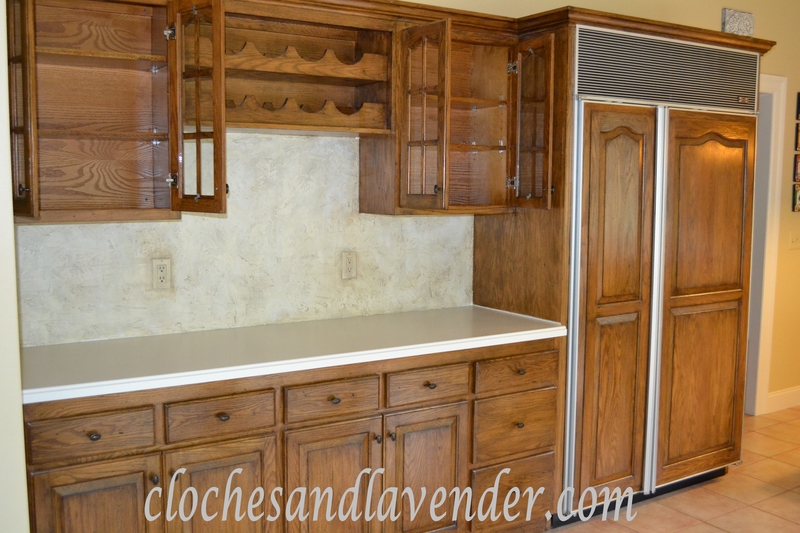 I love the cabinets! 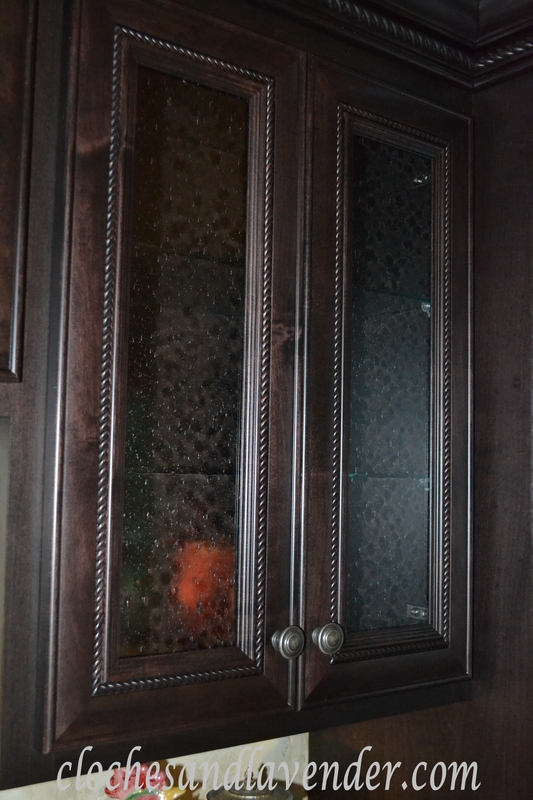 The color, the seeded glass, the rope detailing…it’s all stunning. Great job! The expresso looks incredible! I wish my husband would get on board with it. I love the richness of it. Fantastic job! Me too. It is very rich looking. We love it! Thanks so much. I am so happy with the end result. A wonderful transformation! Thanks for sharing at the All Star Block Party! Turned out gorgeous! 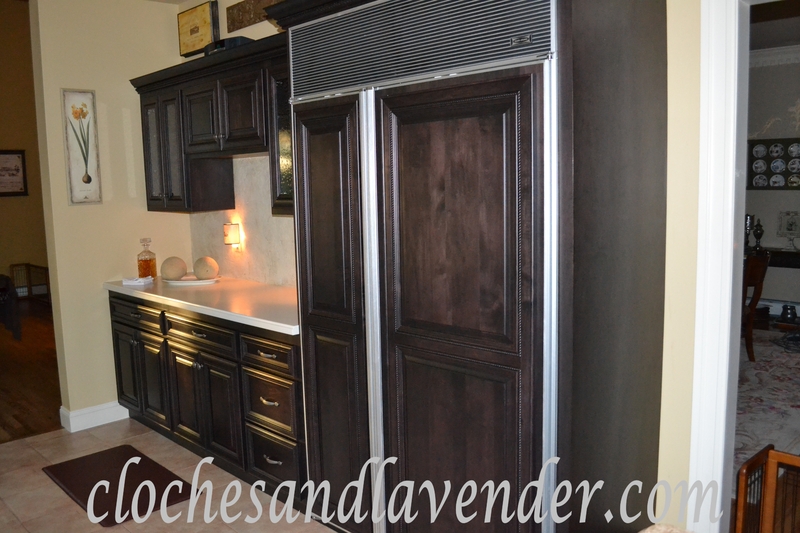 !…Love all the beautiful details and the fridge is just the greatest! Thanks for sharing this beautiful makeover on Simple & Sweet Fridays. Just Fantastic! Hi Cynthia, the Espresso color really is lovely. 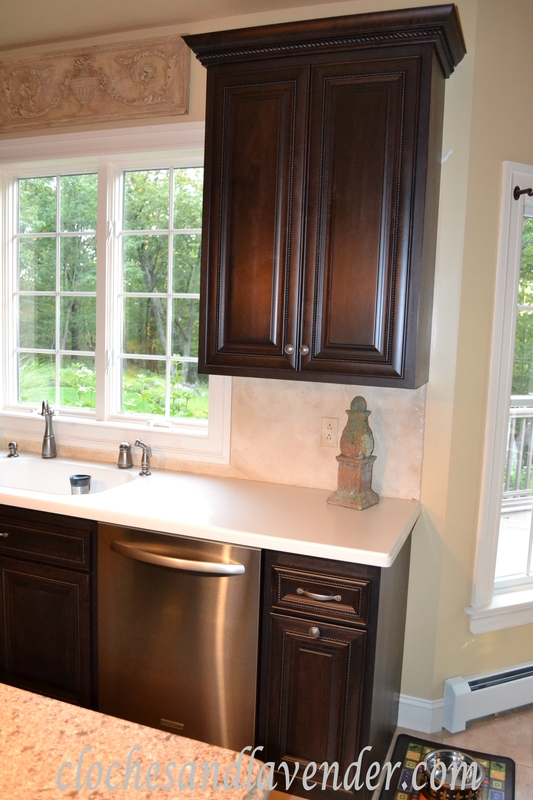 Your kitchen is absolutely gorgeous! Thanks for sharing with Share Your Cup. Beautiful transformation! I k now you must be giddy with excitement. Thanx for coming to THT! I’m a bit tardy, but wanted to leave you a note that you are featured on Potpourri Friday at 2805! Thank you so much!! I am so excited, I love your blog. Did you do this yourself or had a cabinet company do a resurface. My link does not let me know that. Looks great!! Just wondering how you achieved the gorgeous results. We had a cabinet company do the upgrade. 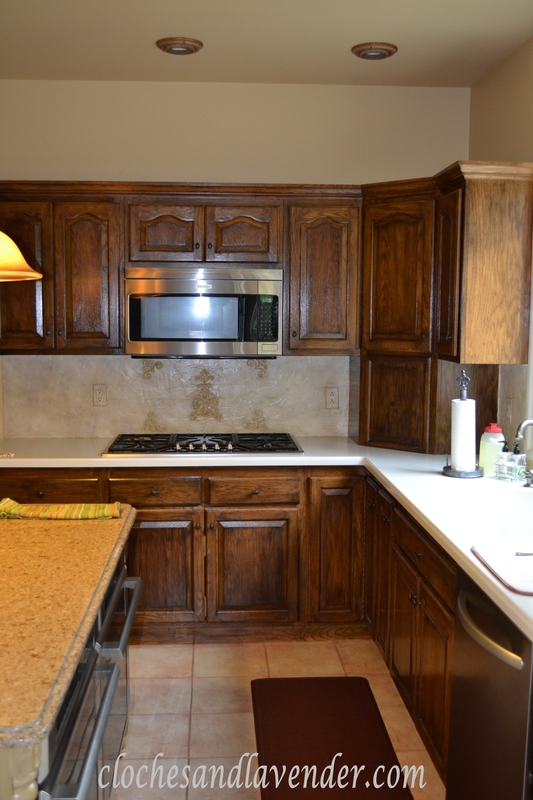 I did the rest of the projects in our kitchen myself, such as the backsplash and my island and other cabinets that we still have in our kitchen. Jaw dropping. Showed my husband. It is PERFECT!!!!!!!!!!! Thank you I hope you will follow Cloches & Lavender. WOW….this is so beautiful. Loving the color! Thank you for sharing one more time at One More Time.